This is Thelma. Despite appearances, she is not a spoon but a monster. She's in sixth grade and is way out of Nigel's league. She wears a side pony. How her purse stays slung over her shoulder is a mystery, since she has no shoulders. First, you are hilarious (the writing). Second, I love her eyelashes and big luscious lips. Plus she wears a purse! No wonder Nigel is going nuts! 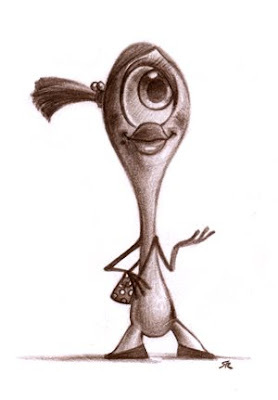 Fantabolus characters sam. I really like them both. I like how you drew them too. What did you use? love the side pony, especially the balls hair band!! those are SO in.